When your phone cluttered up with daily received messages on WhatsApp. Most of the person wipes earlier received images and message in WhatsApp. But if you accidentally delete any important WhatsApp message, then how could you get back or read deleted WhatsApp messages? WhatsApp does not officially support to read the deleted messages, but there is a simple trick which allow you to easily read deleted WhatsApp messages with a little effort. It doesn’t work on the media files. This app allows you to recover all those message which are not greater than 100 characters. When During deleting any messages on WhatsApp you will get a confirmation message with deleting options like “Delete for Me” or “Delete for Everyone”. If you choose “Delete for Me” then selected message wipe from your screen. If you need to remove message from sender and receiver both then your have to choose “Delete for Everyone” option. After deleting the message you will get an message that “You delete this message”. If you accidentally delete any important message and want to recover them then you have to use third party app with the name of “Notification History” app. You can easily download and install this app from Google Play Store. 1. Save and manage messages from apps. 2. Find out which app pushed annoying notification. 3. Auto dismiss USSD and Class 0 dialog (pro version). Whether your messages were erased or not, this app will keep the record of every notification which you get. However, to do that you will have to give it special access to your phone. It may be possible after grant the access this access will override other apps so it can gather notification data. Have you ever tried to recover deleted messages on WhatsApp? Do you use any app to read deleted WhatsApp messages? You have to take few simple steps to read deleted WhatsApp messages using “Notification History” app. Step 1: Go to Google Play Store and download an app with the name of “Notification History”. Step 2: Install this app at your device and give it all the required permissions to access your device’s system settings. Step 3: Now, you can check all the message in the notification log for the WhatsApp message. This is essentially a log of all the notifications that you receive on your phone. When you received or send message not only shown in the WhatsApp but also shows at notification history app. Step 4: Now, if any message accidentally delete from your WhatsApp there is no need to worry. You can easily read deleted WhatsApp message with this help of given simple trick. 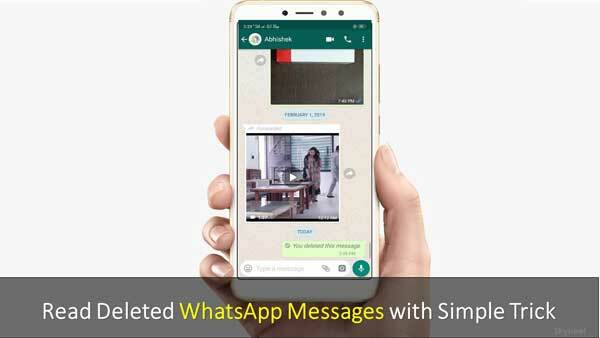 Once, you must try this app at your device to recover and read the deleted WhatsApp messages at your Android phone.